Some product questions may not be addressed in a SDS document, but are still important issues to artists, collectors and the general public. Because we are artists, we view our product the way an artist would view it. Their concerns are our concerns. The following items are answers to the questions that are important to tattoo artists and collectors. Eternal Ink pigments are regularly evaluated and tested. 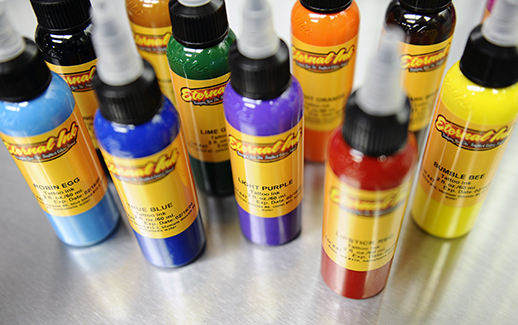 Eternal Ink is made in the U.S.A.
Eternal Inks may sometimes have a mild scent! This is because we only use natural pigments and sometimes nature has a scent. We do not use additives to hide the occasional scent - it wouldn’t be natural if we did.